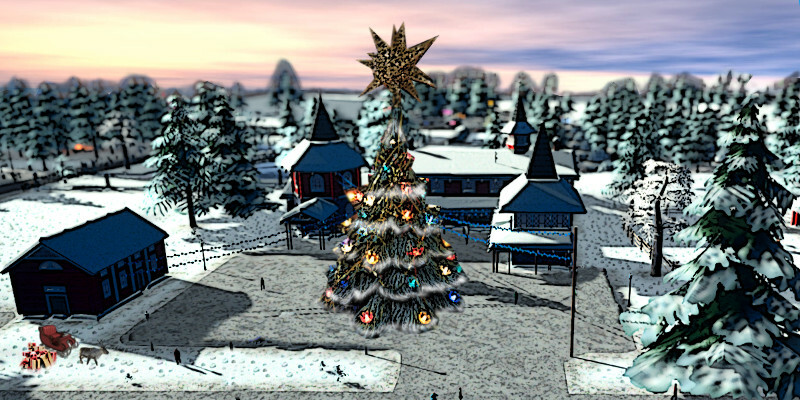 The Christmas Village is a unique place in Malkuth. Christmas is such a big holiday for the earth that a special area in Malkuth is set aside to anchor the Christmas energy all year around, and to make these energies more easily available when Christmas actually does roll around. You can visit the Christmas Village any time of year. To get to the Christmas Village go to HAS and get on the train and it will take you to the Christmas Village. You cannot miss the train, it is the one all decorated in tinsel and garland and has lights all over it. The Christmas Village is very similar to the Malkuth location called the "Carnival.” The Carnival however morphs itself into whatever the current holiday is for you. Where as the Christmas Village stays looking the way it does all year around. Despite what may appear on the earth at times to the contrary, it is the energy of love and kindness that keeps the earth turning and life moving forward. It is only the energies of joy, kindness, and love that create the necessary energy so that physical reality can continue to exist. The universe was born on these energies and it is the binding force that holds together planets, stars, and galaxies. Sandalphon is the main spirit guide here but do not be surprised if you meet Saint Nick (the original Santa Clause). Reindeer and Elfs have been seen here as well. Visit this place anytime you want to infuse yourself with the gift of brotherly love, holiday cheer, and just good old fun. Candy Cane: Stick one of these in your nonphysical mouth to get a burst of energy that you can use to revitalize yourself or some project you are working on. Give one of these to someone you know (nonphysically of course) to help cheer them up if they are sad, lonely or depressed. Hermes unofficial rock and roll song for this location: Wonderful Christmas Time , by Paul McCartney. Hermes unofficial other rock and roll song for this location: Run Run Rudolph, by Chuck Berry.